"There are different kinds of gifts, but the same Spirit distributes them. There are different kinds of service, but the same Lord. There are different kinds of working, but in all of them and in everyone it is the same God at work. Now to each one the manifestation of the Spirit is given for the common good. To one there is given through the Spirit a message of wisdom, to another a message of knowledge by means of the same Spirit, to another faith by the same Spirit, to another gifts of healing by that one Spirit, to another miraculous powers, to another prophecy, to another distinguishing between spirits, to another speaking in different kinds of tongues, and to still another the interpretation of tongues. All these are the work of one and the same Spirit, and he distributes them to each one, just as he determines." "Love must be sincere. Hate what is evil; cling to what is good. Be devoted to one another in love. Honor one another above yourselves. Never be lacking in zeal, but keep your spiritual fervor, serving the Lord. Be joyful in hope, patient in affliction, faithful in prayer. Share with the Lord’s people who are in need. Practice hospitality." Oh, my. That sounds like a big deal. Are you starting to get what I'm starting to get? Here's a couple more: 1 Peter 4:9 "Offer hospitality to one another without grumbling." 3 John 1:8 "We ought therefore to show hospitality to such people so that we may work together for the truth." Maybe I'm the only one who didn't realize this, but I'm not sure that until lately, I knew that we were ALL commanded to practice hospitality. Guess I'm not going to be able to hide behind the "that's not my gift" excuse any more. I'm betting Paul said "practice hospitality" for just that reason. We don't have to be gifted at it, we just have to do it, and it takes practice. It's time to get out of my comfort zone, clean up this house, and invite some folks over. I probably won't be the perfect hostess, but I'll be practicing! Let's all pray today for God to open our hearts and show us ways to welcome our friends, and sometimes strangers, into our homes and lives regularly. Now, I need ideas! 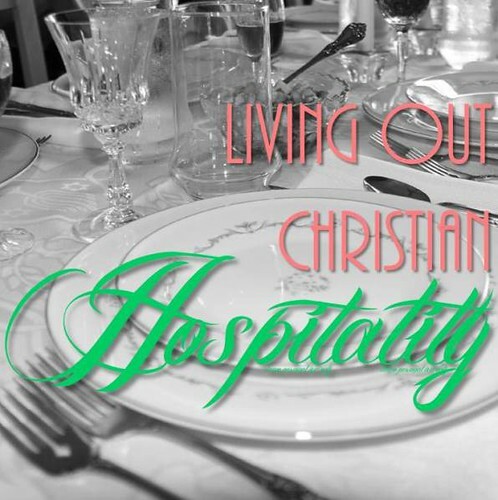 Leave a comment below and tell me ... What are some of your favorite ways to show hospitality? **Note from Becky: If you're looking for some inspiration in the hospitality department, I love the products from Mary & Martha because they focus on hospitality while sharing the gospel at the same time. Thanks Penny for such a great post! I know it's something I need to work on. Penny Lane is a mother of 2 girls and half of a sister-blogging-team at Sisters Raising Sisters. She is an aerospace engineer and astronaut trainer for NASA whose counter-culture career is now on-hold so she can more fully invest in her family and work to change the culture her girls are destined to encounter. Her home is filled with equal parts rockets and baby dolls. She daily navigates strewn-about racecars and tea sets while teaching her daughters to change diapers, change the oil in the car, change preconceptions, and that it’s okay to maybe someday change their last names. And just like her mother before her, and her big sister, above all, she is teaching her girls to be unashamed, unwavering, unstoppable women of God.